Many versions of the great folk song. Westerns have guns. Lotsa guns. if it doesn’t have guns in it. Or even worth watching. Yet I don’t often profile Guns in the Westerns anymore. I stopped. Not for Political, Social or Spiritual reasons. But because most Westerns use the same guns. 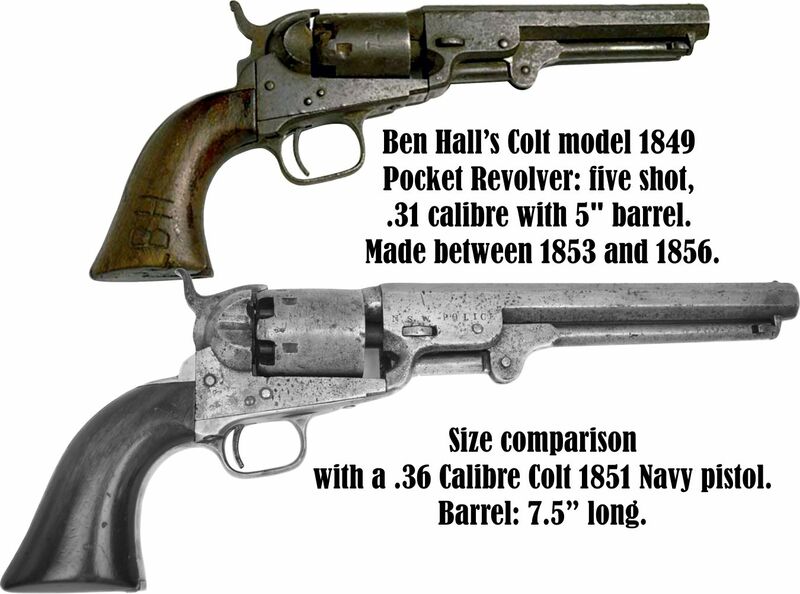 Ben Hall, however, has a few new (old) Guns that I’ve never seen before. 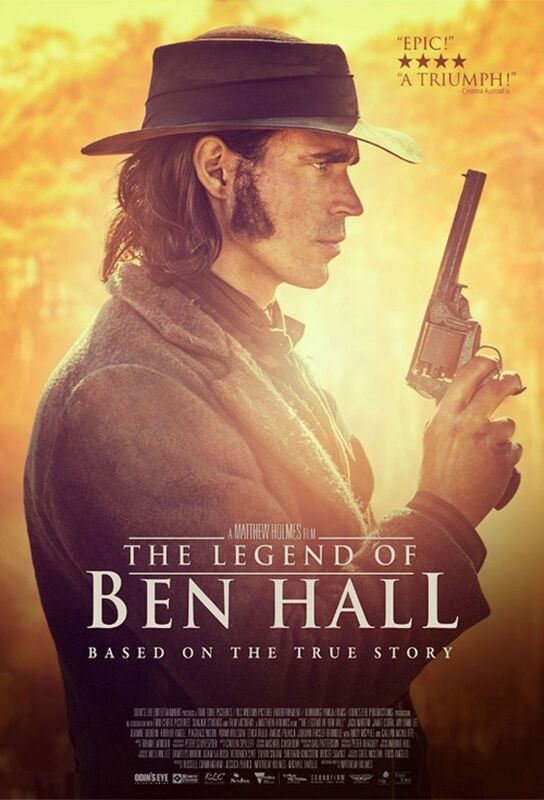 Firstly, you might be wondering why Ben and his friends are bristling with a rather large number of firearms. There was a good reason. This was the Cap and Ball era. Pre-cartridge. Re-loading was a timely exercise – very impractical during a fight. Solution: carry lots of guns. I’ll cover Cap and Ball loading and Bullet Making in my next post. 1856 Tranter .38 caliber, double trigger, five shot, percussion revolver. at the Billabong where he was killed. Here’s it’s Cap and Ball Gun Kit. 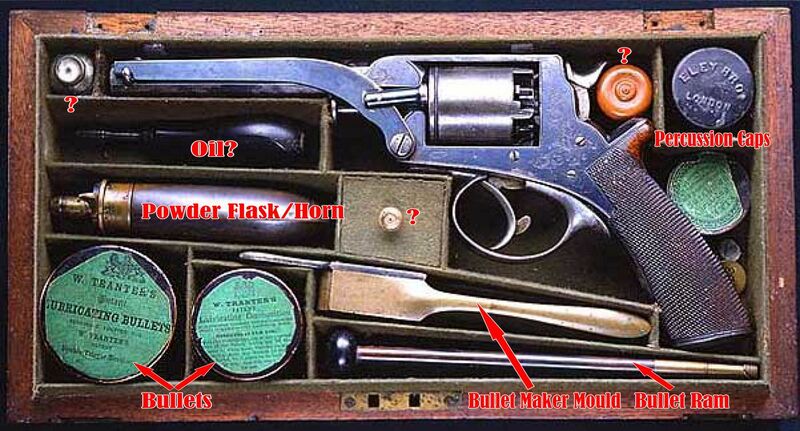 1856 Tranter .38 caliber, double trigger, five shot, percussion revolver gun kit. Unlikely Ben toted a kit around – but he definitely had all these tools. May I now confess that I am no gun expert? I cannot identify everything in this kit. and did a lot of shooting when I was kid, I don’t even own a gun now – of any kind. And haven’t shot one in a long – except in computer games (Where I’m an expert). Those of you out there who can ID the items in the kit please step forward. There’s no reward, but I’ll be grateful. Proper cleaning and maintenance of your guns was essential. Otherwise jamming, misfires, fouling and other evils could occur. Clint Eastwood has favoured ‘cap and ball’ revolvers in some of his Westerns though I don’t recall him being seen loading one. Thank You. Was that Josey Wales? I believe so. 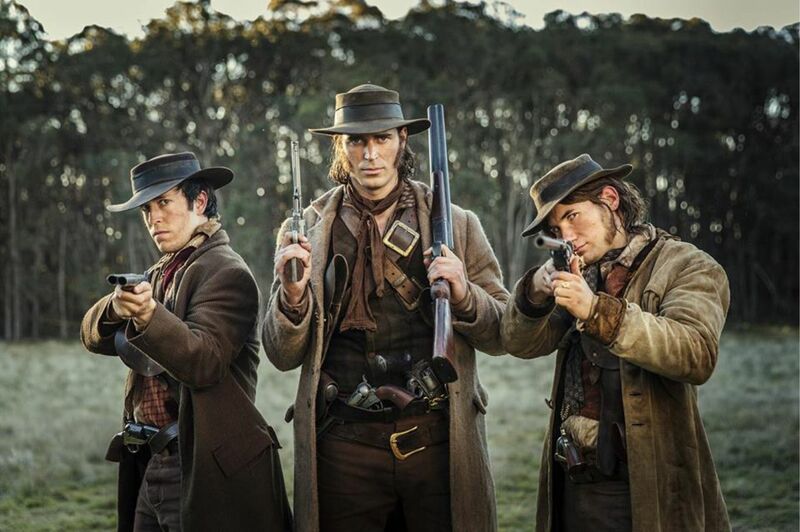 You can see that Josey carried about 4 pistols – for the same reasons I’m sure. Lots of guns, none of which should accurately. Wild fighting to come! You’re right. They didn’t have the range and accuracy of modern weapons. BUT they were still lethal. 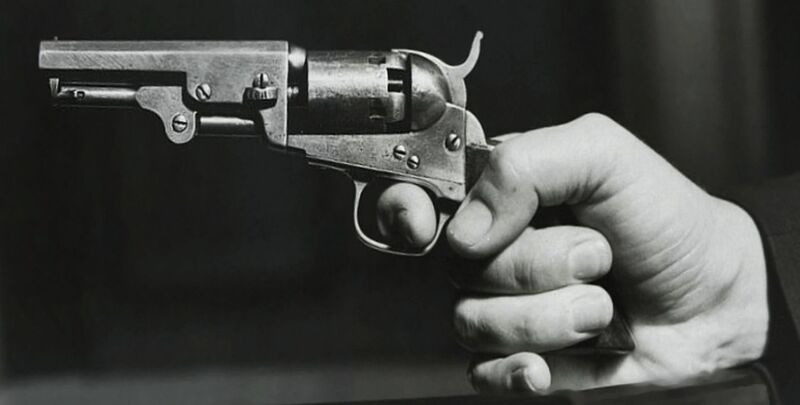 They lived by the gun – and died by the gun. Only Dunn survived. To be hanged. Like you, JC, I don’t own a gun anymore. I grew up with guns and hunting, but haven’t fired a gun since the Army. Except for assault rifles I have nothing against having guns, providing they are kept secure from children and thieves. Absolutely Don. It’s a legitimate recreation – for responsible people. I’d guess that about 99% of gun owners will never have a negative incident with their firearms. I have nothing against hunting either – if you are going to use what you shoot: ducks, geese, deer, etc – I’m not a fan of Trophy Hunting though. Yes … and who needs an assault rifle? Here’s an interesting thought though – we already have Virtual Reality. It’s only a matter of time before we combine Virtual Reality and Holograms. Then we will have Holodecks like on Star Trek. You will be able to do ANYTHING. Go to the moon – shoot any gun you want – go anywhere – do anything – for free. How about that? WestWorld? Here we come.